Diamedica, the designer/manufacturer of anaesthesia and respiratory solutions based in Bratton Fleming in North Devon, has won two out of the six awards at the recent Africa Healthcare Summit in London: the International Innovation of the Year and the Solution of the Year. Diamedica won the awards for its Helix Portable Ventilators. Their design builds on earlier ventilators made by the company and includes similar gas-efficient techniques identified in the peer-reviewed AAGBI journal, Anaesthesia. 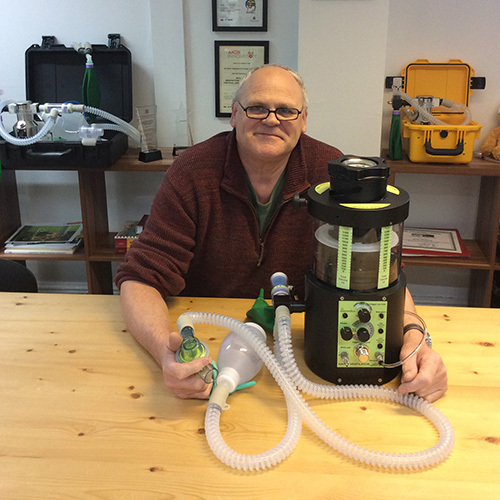 Feedback from customers plus continuous assessment, testing, research and development have resulted in a ventilator that has become the first choice for humanitarian responders in disaster situations, while it is also ideally suited for use in hospitals in low resource settings. Designed for versatility, the Helix Portable Ventilators, which are suitable for adult, paediatric and neonate patients, can be used as standalone equipment, or in conjunction with Diamedica’s Portable Anaesthesia systems. The ventilators do not require electricity because they will use drive gas from any source – oxygen concentrator, cylinder or air compressor – and the additional Helix Compressor Pump will run the ventilator for up to 20 hours continuously on a single charge. That this award was given at a summit gathered to serve Africa was particularly encouraging to Diamedica. The practicalities of the ventilator are manifold, whether for emergencies, or in remote situations where there is no electricity. Each ventilator is a time-cycled, volume-limited pressure generator and has been designed to enable the driving gas to be used to maximum efficiency. As an additional contribution to efficiency, the oxygen driving the ventilator is recycled by being collected and returned to the breathing circuit to supplement the inspired oxygen concentration. The judge at the Africa Healthcare Summit confirmed the ventilators’ excellent qualities saying: “The International Innovation of the Year goes to Diamedica. They use innovative technology to create robust equipment that incorporates clever features to ensure the equipment continues to work when electricity or oxygen supplies fail. “In many parts of the world, hospitals have to provide services in conditions that are far from ideal, and in which much standard hi-tech medical equipment is unsuitable and fails to function for long. The judge added: “Diamedica is also taking The Solution of the Year. This company specialises in the design and manufacture of anaesthesia and related equipment that will function reliably in harsh environments and areas of limited logistical support. The company exports almost 100% of its output from its Exmoor base in Devon (UK) to over 70 countries, half of them in Africa. For more information visit diamedica.co.uk.